Is it a tablet? Is it a phone? Really... do you care? Yeah, it's big. Really big. This is Sony at its best - all its great technology is packed in here. It's enormous though, so make sure you're ready for the added heft and looks you'll be getting. 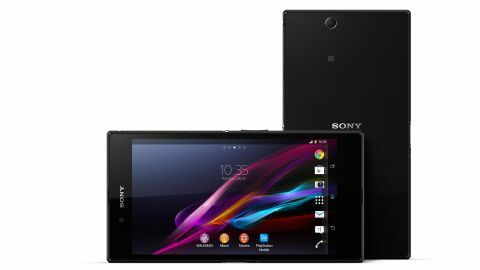 The Sony Xperia Z Ultra is a phone that takes the best of the internet and lets it all fly across an impossibly large screen. With the best of Sony's technology inside, does the 6.4-inch screen put it out of reach for most people? Let us paint you a picture: a man walks into a bar. Pulls out his phone. It's got a five-inch screen. The jukebox grinds to a halt, glasses drop, smash on the floor and the crowd recoils in horror. If you could see that happening just two or three years ago, can you imagine the scene if you whipped the even bigger Xperia Z Ultra out in public? There'd be carnage. As it is, you'll certainly raise more than a few eyebrows. Sony's continuing its assault on the portability market – indeed, it's continuing its assault on our senses too. The Xperia Z Ultra is a massive phone. Or a small tablet. A phablet, even, if you subscribe to that idea. Because let's face it – these things are no longer obscene. Like them or hate them, big phones and small tablet combinations appear to be here to stay. And Sony clearly wants a nice meaty slice of the pie. There have been some genuine innovations over the last year – with megapixel levels pushed up to 20MP and phones and tablets that are waterproof. We never tire of being able to run a tablet under the shower just for the hell of it. You can do that with the Xperia Z Ultra. But it still doesn't feel right. And where Samsung took the plunge two years ago now with the Galaxy Note, the phablet section which many (this reviewer included) thought would never grow has soared. Everyone seems to be walking around with them (or maybe we just notice them more because they're so different, so it seems like everyone has them) but other OEMs have spotted there is money to be made here. And this is Sony's first attempt at the middle ground. In terms of the competition, the Xperia Z Ultra is firmly pitted against one device: the also just released Samsung Galaxy Note 3. It's bigger – in fact, it's a similar size to the Galaxy Mega, Samsung's own huge offering – but specs wise, it's nearer to the Note range. It even nods its head towards Samsung's big selling point on these devices – the S-Pen – with a pencil recognition capability. We'll explore that later in the review. Let's just say that, for now – if you think you know what to expect when you grab the Xperia Z Ultra, you're probably mistaken. We knew it would be big. But boy, does it feel enormous. Then again, big is beautiful and the Xperia Z Ultra feels like a genuinely expensive, classy piece of kit. If you've fondled an Xperia Z phone at any point, you'll know what we're talking about here. All black glass, high gloss, front and back with very little to interrupt that apart from the Sony logo on the front and the Xperia logo on the back. In fact, if you've felt the new Nexus 7 2013 model, you'll feel right at home. As we look at it, all we can think is how much it looks like it could be that device's little brother. And that's definitely not a bad mantle to have. When the screen's off, it melts away and the whole front just looks like one beautiful black panel. If you look hard, you'll spot the front facing camera at the top, but not the notification light, which also sits there hidden from view. The left hand side has the charging offerings – two contact points for a dock and the actual micro USB slot which, like many other devices, is hidden behind a rubber port. This keeps it forever watertight so that you can actually functionally use the Xperia Z Ultra in the bath without fear. Sony appears to have listened to grumbles past and made it a little easier to open and close without the flap getting in the way. Round the other side, you'll see areas for the microSD expansion slot and SIM card insertion (again, hidden by rubber stoppers), the volume rocker and standby button. We'd normally moan here about the placement of the standby button but the fact is that it's not so much of an issue on a handset of this size. Everyone will hold theirs differently, but everything seemed well placed. There's also a headphone jack at the top of this side. What's great is there is no covering for the headphone socket – and yet, this too is waterproof. Goodness knows what Sony's managed to do here, but it's made it work and it means there is one less annoyance when you want to listen to some music or just audio in general. Big thumbs up here. And that brings us to the elephant in the room. And by 'elephant', we mean it, since size is everything here. The Sony Xperia Z Ultra is enormous. We're talking dimensions of 179 x 92 x 6.5mm. That means it's tall, it's wide. But it's also actually rather thin, and we like that. The weight is very evenly distributed. The worst thing Sony could have done is give us something that was top- or bottom-heavy and very difficult to handle. This works perfectly for us. Did we mention that it's big? It's when you press that standby button on the side that you see where the magic really lies. The Xperia Z Ultra has the most beautiful display. 6.4-inches in size with 1920 x 1080 resolution. That works out as a PPI of 344, which is more than enough for even the best opticians. You will not see any pixels on this screen. Some reviews have slated the color for being washed out. We certainly had no complaints there. Whereas the Xperia Z phone from earlier this year had the worst issue with viewing angles, it seems Sony has listened and fixed that with this model. In fact, our only complaint was with the lack of vivacity. We were using our review model alongside a Samsung Galaxy S4 which, of course, uses a different type of panel. Many complain that Samsung's are too bright, too colourful, and not realistic enough. It's horses for courses and some will prefer the Xperia Z Ultra's truer-to-life palette. Either way, we challenge anybody to pick this device up and not be impressed with the screen. They may be unimpressed with the ability to swap the battery out though. Yes, more and more manufacturers are sealing their power packs in, but with a device like this, which screams out to be a movie player for the commuting hours and a PDA for the rest of the day, this is going to use some juice. It's not always practical to carry a charger around, and we would have preferred a little trade off in the design to allow a spare battery option. That's even more so considering the price. As you'd expect, the Xperia Z Ultra is NOT cheap by any standards. SIM-free, you'll struggle to pick one up for much less than £600 / $675 (Around AU$638), although some stores are bunging a Smartwatch 2 in with the phablet. Either way, don't expect to get this device free on a contact unless you're willing to part with around 25% more per month compared to the Sony Xperia Z1 each month for two years. Sounds a lot on the face of it – but if you'll use this as a phone and a tablet, it may represent a saving. You'll still likely be broke – but a little happier.